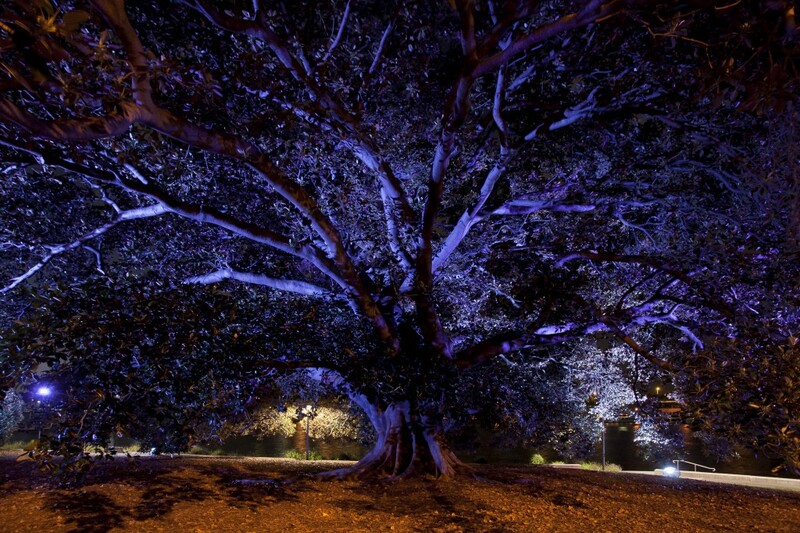 Lights bathe the trees in their own ever-changing ‘opposite twilight’ each day after sunset. To achieve this, a world-first, custom-built, colour-sensitive system continuously samples, and then inverts, the colour of the evening sky. As the earth seeks to balance the sky through colour opposition, the turbine balances the electricity used to create it. 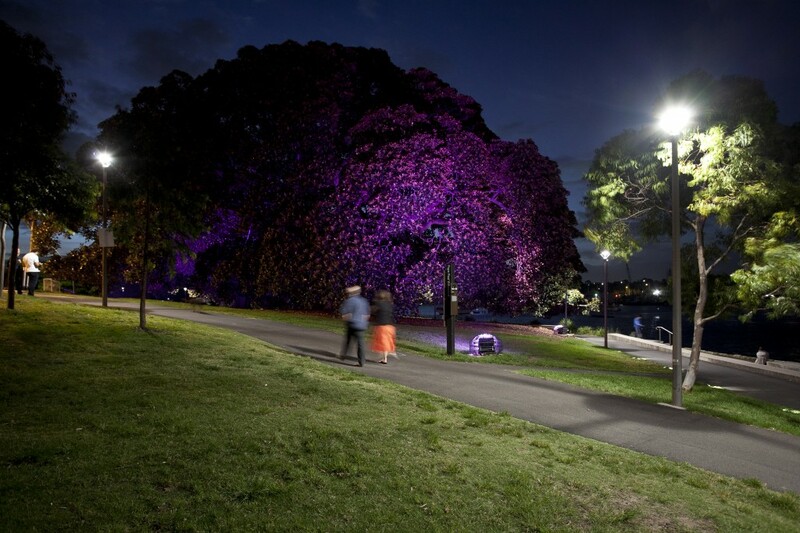 Earth v Sky is a dynamic artwork by Allan Giddy located in Bicentennial Park, Glebe. 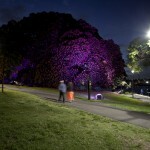 Powered by a wind turbine, two magnificent Moreton Bay fig trees are bathed in coloured light determined in response to the changing evening sky during sunset. Newly developed technology samples the colour of the sky and, using this data, the projected colours reflect the reverse of those in the sky. 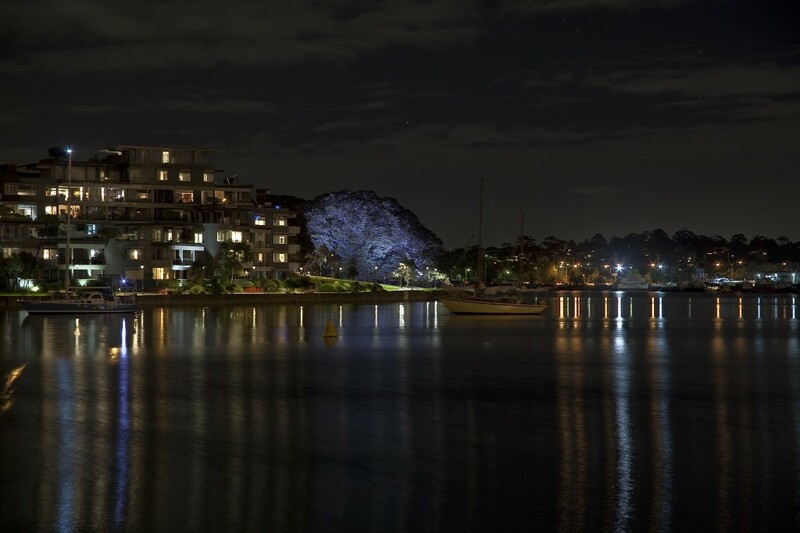 The lights fade in gently and are initially barely noticeable on the trees at close range. Over an hour, they slowly increase in intensity, also moving through a spectrum of colours in response to the sunset. The lights then fade to black along with the night sky. 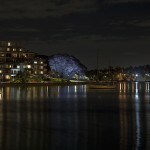 The trees are lit for a short period during the early evening, between 1 and 2 hours depending on the season and length of sunset. Earth v Sky is a poetic environmental artwork; an adoration of nature, sustainably powered by the element of wind. 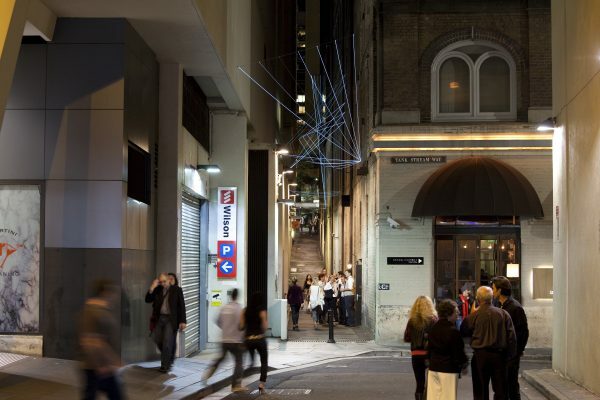 It is about subtle gradations of the colour of light, in nature and our urban situation – difficult to represent in a static image. The work speaks of the relationship between the earth, where we dwell, and the ever-changing sky; always in gentle opposition, like a conversation. 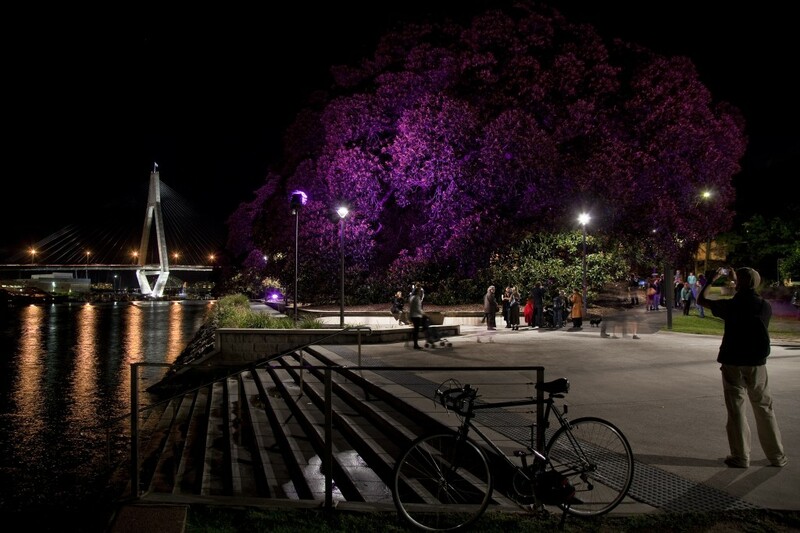 Lighting is a fundamental part of the artwork, reflecting the extraordinary spectrum of the evening sky. The data sampled from the sky is inverted by computer-controlled programming into the opposite colour. A specific task controller motivates 9 LED colour-changing architectural lights. 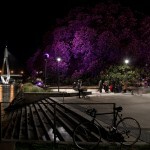 Each light contains 3 colours of LEDs which are DMX-mixed to output up to 300 different colours. 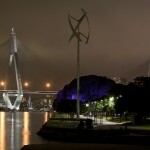 The installation is sustainably powered by the City of Sydney’s first wind turbine. 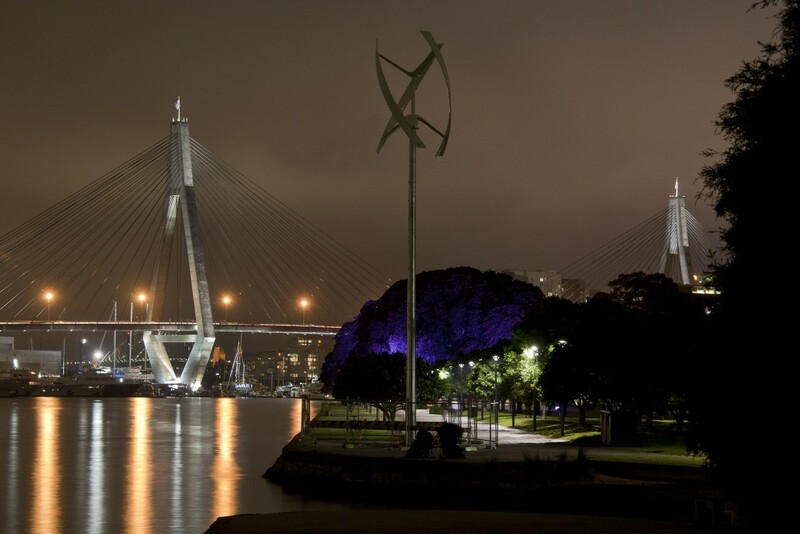 The wind turbine is at the entrance to Johnston’s Canal and brings a critical component to the artwork, heralding the arrival of new sustainable infrastructure into the city. The turbine powers the artwork, which uses approximately 965 kW hours a year, with a greater amount returned to the grid. 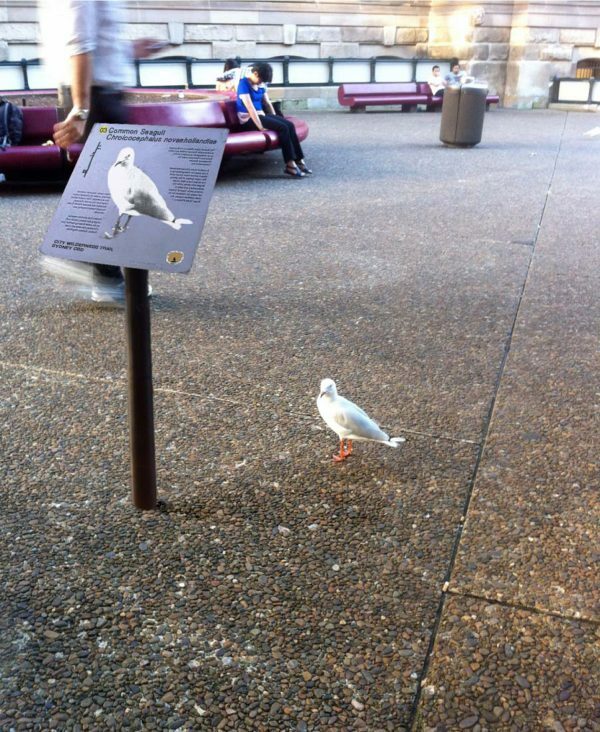 This information is measured and tracked in real time. 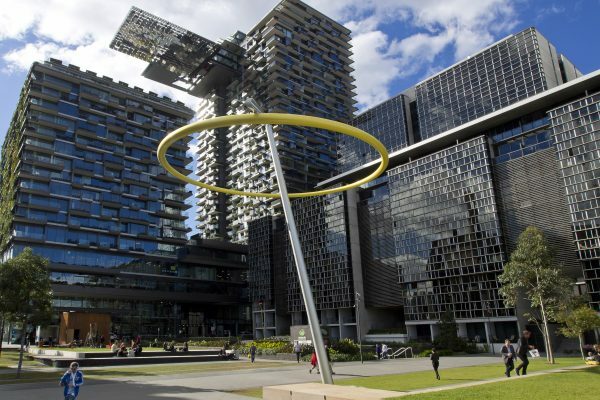 During the development of Earth v Sky, residents expressed concerns about noise from the wind turbine and its potential to harm indigenous birds and Sydney’s flying foxes. 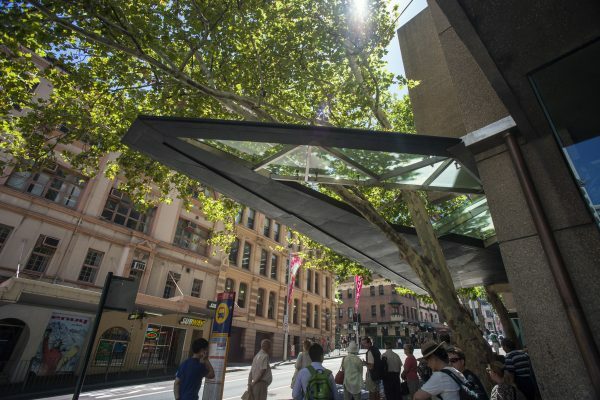 Council responded to the community’s concerns by engaging the Australian Museum to monitor the activity of indigenous species before the turbine was installed and review of the turbine’s effects on wildlife for 12 months afterwards. 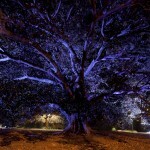 Allan Giddy is a pioneer of alternative energy systems and light in time-based sculpture. 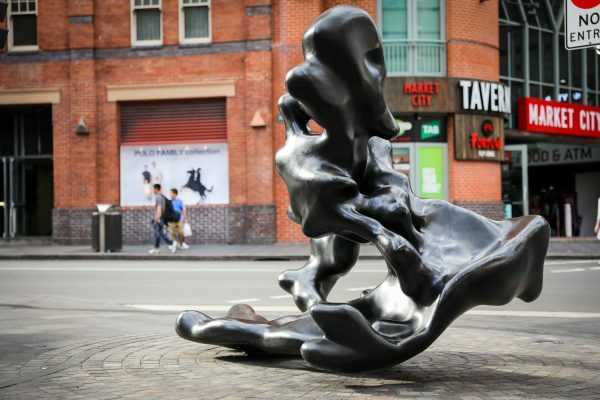 He is the director of the Environmental Research Initiative for Art (ERIA) at UNSW Art & Design, an organisation aimed at reinvigorating decaying public spaces through the installation of ‘active’ artwork. A world-first, colour-sensitive light controller was been developed by the artist with the assistance of Mr Snow from the House of Laudanum.